U.S. 1 Business follows original U.S. 1 through Bel Air and Hickory. The business route was originally signed in the 1960s when U.S. 1 shifted to the Bel Air Bypass. When the Hickory Bypass opened in 2000, U.S. 1 Business was extended over Conowingo Road through Hickory. Like U.S. 13 Business in Salisbury and Maryland 5 at Hughesville, signs for U.S. 1 Business through Bel Air and Hickory utilize a white on green or green on white color scheme. U.S. 1 Business continues Bel Air Road from U.S. 1 and the Bel Air Bypass. The bypass north of the Harford County seat was constructed between 1963 and 1964. Photo taken 07/06/10. Leaving the Benson community, U.S. 1 Business (Bel Air Road) sees a second shield ahead of the intersection with Old Joppa Road. Photo taken 07/06/10. Old Joppa Road provides a direct route south to Maryland 152 (Mountain Road) at Stockton from Bel Air. Photo taken 07/06/10. Continuing east, Bel Air Road spans Winters Run and transitions into a commercial arterial. Photo taken 07/06/10. Amid a sea of asphalt, U.S. 1 Business lives up to its name with numbers shopping centers flanking the intersections with Tollgate Road and Maryland 24 (Vietnam Veterans Memorial Highway). Photo taken 07/06/10. Maryland 24 assembly posted along Baltimore Pike east across from the Harford Mall. Photo taken 07/06/10. 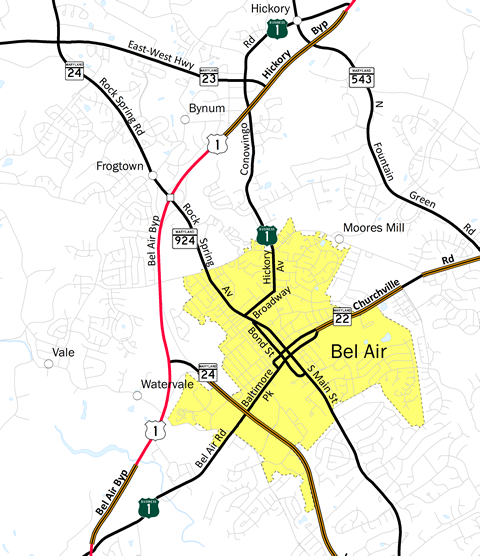 Maryland 24 constitutes a controlled access arterial through Bel Air, linking U.S. 1 Business with the Bel Air Bypass to the north and Exit 77 of Interstate 95 to the south. Photo taken 07/06/10. Maryland 24 represents the main corridor of development between Interstate 95 and Bel Air. The state highway shifted from its original alignment (Maryland 924) west in 1987 and exists as a controlled access route between U.S. 1 and Aberdeen Proving Ground. Photo taken 07/06/10. U.S. 1 Business (Baltimore Pike) continues across Maryland 24 between additional shopping centers to Atwood Road. Photo taken 07/06/10. The second shopping center based traffic light east of Maryland 24 along Baltimore Pike. Kelly Avenue ties in from the north, but provides no outlet to the residential area behind the adjacent strip mall. Photo taken 07/06/10. Atwood Road provides a back route to Maryland 24 (Vietnam Veterans Memorial Highway) south via Marketplace Drive. Northward the road becomes a residential street. Photo taken 07/06/10. One block west from the merge with Maryland 924 (South Main Street) north near downtown Bel Air. Maryland 924 travels a one-way street couplet through the central business district, utilizing South Bond Street and Kenmore Avenue south and Main Street north. Photo taken 07/06/10. Baltimore Pike transitions into the eastbound beginning of Maryland 22 (Fulford Aveune) at the U.S. 1 Business turn onto Maryland 924 (South Main Street) north. Maryland 22 travels 12.91 miles east to Churchville and Aberdeen. Photo taken 07/06/10. Maryland 924 represents old Maryland 24 southward from Bel Air to Emmorton. The state route travels 7.34 miles overall east of Vietnam Veterans Memorial Highway. Photo taken 07/06/10. U.S. 1 Business shield assembly posted at the Baltimore Pike intersection with Maryland 924 (South Main Street) north and Maryland 22 (Fulford Avenue) east. Photo taken 07/06/10. Maryland 22 ends via Churchville Road west at U.S. 1 Business & Maryland 924 (South Main Street) north. Churchville Road west becomes unsigned Maryland 922 en route to Hays Street south. U.S. 1 Business south utilizes the state route between Bond Street and Baltimore Pike. Photo taken 07/06/10. U.S. 1 Business is not acknowledged along the Main Street portion of Maryland 924 between Baltimore Pike and Broadway. Photo taken 07/06/10. Courtland Street flows east from Maryland 924 (Bond Street) south to Hickory Avenue and Courtpland Place across Main Street north. Photo taken 07/06/10. Main Street northbound at the signalized intersection with Pennsylvania Avenue west and Kimmie Way east. Photo taken 07/06/10. U.S. 1 Business reappears at its split from Maryland 924 (North Main Street) for Broadway east. Photo taken 07/06/10. Broadway carries U.S. 1 Business east a short distance to its turn onto Hickory Avenue north. Photo taken 07/06/10. Hickory Avenue stems north from Maryland 22 (Churchville Road) west at Maitland Street to the Bel Air city line. Photo taken 07/06/10. Heading north along Hickory Avenue from Broadway on U.S. 1 Business. Photo taken 07/06/10. U.S. 1 Business exits the city at the Hickory Avenue transition to Conowingo Road at Moores Mill Road. Moores Mill Road straddles the city line west to Maryland 924 (Rock Spring Road) and east to Broadway. Photo taken 07/06/10. Leaving Bel Air, U.S. 1 Business follows Conowingo Road northward to Hickory. Photo taken 07/06/10. U.S. 1 Business returns to U.S. 1 (Bel Air Bypass) at the transition to the Hickory Bypass. Photo taken 07/06/10. U.S. 1 joined the Hickory Bypass upon its completion in 2000 to bypass Hickory to the south. U.S. 1 Business was extended along old U.S. 1 (Conowingo Road) in the process. Photo taken 07/06/10. Reverse white on green shields for U.S. 1 Business appear for the route through Bel Air. This assembly directs motorists from Tollgate Road south onto Baltimore Pike north. Photo taken 07/06/10.